Swift at Bankside Stables in Stowting, near Hythe, Kent sleeps 2 people. Bankside Stables near Hythe are a couple of holiday cottages; Swallow (ref UK11193 [Swallow]) and Swift (UK11236) are situated in a beautiful part of Kent known as the Kent Downs Area of Outstanding Natural Beauty, nestling in the eastern half of the North Downs. It is an area of picturesque farms and rural landscapes. 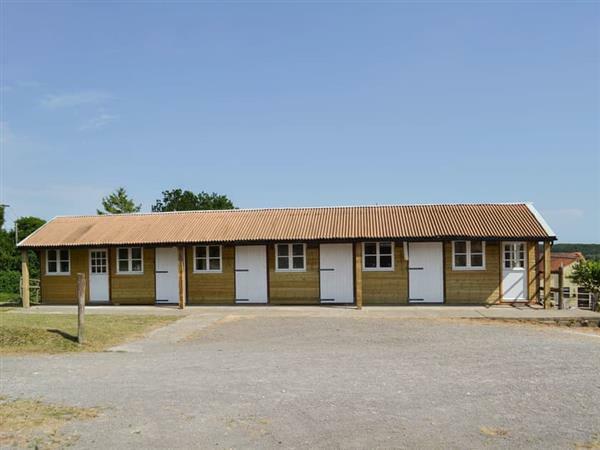 These stables have been thoughtfully converted into two adjoining holiday properties, each with their own sitting-out area to the front, and are set on a 10-acre smallholding where there is a livery yard and chickens. There are walks to enjoy from the doorstep including the North Downs Way, or visit the beautiful city of Canterbury, 8 miles away, where you can bring your bikes and travel round one of the cycle trails or try the Great Stour Way. The cathedral is breathtakingly beautiful and well worth a visit, and it forms part of a UNESCO World Heritage Site. Visit Chaucer’s Canterbury Tales or explore the restaurants, bars and shops. The port of Dover is 12½ miles away and offers the opportunity of day trips to France (bring your passport). Take a walk along the iconic white cliffs at Dover or visit Dover Castle. Animal lovers should visit the Port Lympne animal safari park or Howletts, where you can see the African elephants and monkeys in an open topped enclosure. Spend a day at Hythe or Dymchurch if you prefer a sandy beach. There are rail connections from Westerhangar to London for further sightseeing opportunities. Trout fishing and golf can be found locally, and there is a pub within walking distance. The beach is 11 miles from Bankside Stables near Hythe. With the shop 3½ miles, and the pub & restaurant are ½ mile from Bankside Stables. Swallow (ref UK11193 [Swallow]) and Swift (ref UK11236) can be booked together to sleep up to 4 people. Swift is all on the ground floor. Living area: With 38 Freeview TV. Both properties: Oil central heating, gas, electricity, bed linen, towels and Wi-Fi included. Travel cot and highchair. Laundry service available on request. Sitting-out area with garden furniture. 10-acre grounds (shared with owner and other property on-site). 2 dogs welcome, to be kept on a lead at all times (livestock). Stabling for horses available on request. Private parking for 2 cars. No smoking. Holidays at Swift, Bankside Stables run from Saturday to Saturday. Pets allowed at Bankside Stables - Swift. For a better idea of where Bankside Stables - Swift is, you can see Bankside Stables - Swift on the map below. Bankside Stables - Swift is in Kent; should you be on the lookout for a special offer, you can find all the special offers in Kent. It's always worth checking to see what is on offer at the moment. Do you want to holiday near Bankside Stables - Swift (UK11236), you can see other cottages within 25 miles of Bankside Stables - Swift; have a look to find your perfect holiday location.